Nestled among the Little San Bernardino Mountains, the desert oasis at Big Morongo Canyon is one of the 10 largest cottonwood and willow riparian (stream) habitats in California. The upstream end of the canyon lies in the Mojave Desert, while its downstream portion opens into the Colorado Desert. Because of the fault line running along the base of the mountains, water draining from the Morongo Basin surfaces at their base. 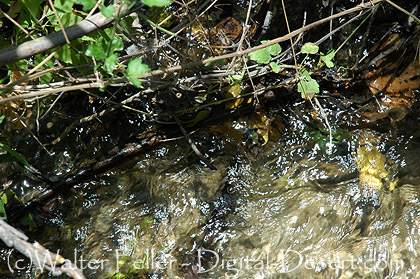 This water flows above ground as Big Morongo Creek, then disappears into sandy soil further downstream. The result is a three-mile stretch of rich stream and marsh habitat lying between rugged canyon walls. The Bureau of Land Management designated Big Morongo Canyon as an Area of Critical Environmental Concern in recognition of its special values. The land is managed by the BLM to protect rare and endangered wildlife, enhance sensitive riparian areas, promote the growth of a wide variety of plants, provide for scientific research, and offer educational opportunities. For many centuries Big Morongo Canyon was used by nomadic Indians as an easy route between the high and low deserts. In the canyon, water was plentiful and the grade was gentle. The last people to inhabit the canyon before the advent of white settlers were the Morongos, a powerful clan of the Serrano Indians. In 1846 the Morongos were moved to a reservation, and the canyon passed from one rancher to the next until 1968, when 80 acres were sold as a partial gift to The Nature Land Conservancy by J.L. Covington. Soon afterward 160 acres of adjacent land to the north was obtained by San Bernardino County to form the Big Morongo Canyon Regional Wildlife Preserve. In order to prevent Big Morongo Canyon from becoming a biological island without viable connection to larger habitat blocks, it is essential to preserve the remaining corridors connecting Joshua Tree National Park, Big Morongo Canyon, the San Gorgonio Wilderness and San Bernardino National Forest to maintain genetic diversity of desert bighorn sheep and other wildlife. The Preserve has a desert climate with hot, dry summers and moderate winters. Rainfall is scarce, with an average annual total of 8 inches. Snow melt from the from the San Bernardino Mountains flows underground until it emerges from the mountains northwest of Morongo Valley and flows intermittantly on the surface of the creek bed. The water percolates quickly into the sandy soils as it crosses the Morongo Basin, but as the water enters Big Morongo Canyon it encounters finely pulverized rock called fault gorge along the earthquake fault. This layer of ground rock is impermeable to water, and acts like a dam, bringing water to the surface in a series of perenial springs, whose waters disappear into the sandy layers further downstream. Within the Preserve occur some of the oldest rocks in the state of California, dated at almost two billion years. They consist of former (metamorphic) granitic rocks that have been altered by heat and pressure to form gneisses and shists. 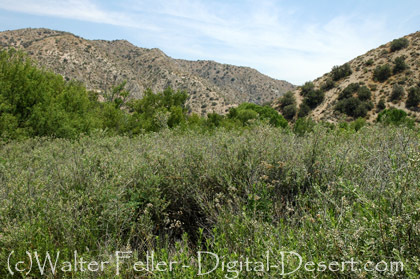 The lush vegetation of the oasis in Big Morongo Canyon stands in sharp contrast to the surrounding desert slopes. 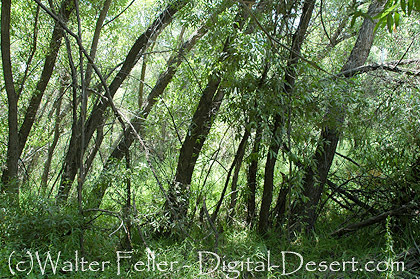 A high water table has made the growth of tall trees possible despite the desert climate. 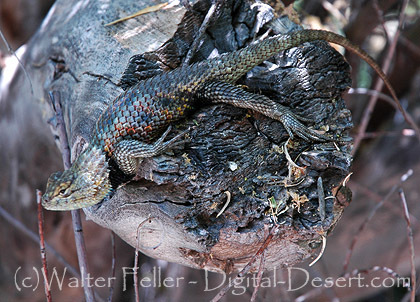 The desert springs ecosystem and Mojave Riparian Forest here are considered to be some of the best in California. In addition, the area is of botanical interest because it contains two desert vegetation zones, the Mojave and the Sonoran. Dry slopes are characterized by low creosote brush scrub at lower elevations, and pinyon-juniper woodland at higher elevations. The Preserve offers food, cover and water to many resident birds, and shelters many migrant and vagrant species. Several rare or unusual species are known to nest at the Preserve, including "Least" Bell's Vireo, Brown-crested Flycatcher, Lucy's Warbler, Summer Tanager and Vermillion Flycatcher. Many other species are present during the Spring and Fall migration seasons. A number of mammals occur here including desert bighorn sheep, mule deer, mountain lion, gray fox, kit fox, raccoon, bobcat, coyote, kangaroo rat and other rodents. The availability of water brings the bighorn sheep and other animals onto the canyon during the hot, dry summer months. 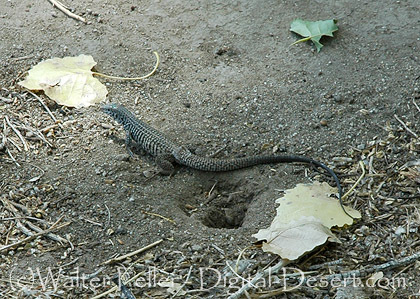 Several species of reptiles and amphibians are also present, including gopher snakes, king snakes, common whiptail lizards, chuckwallas, horned lizards, and Pacific tree frogs. Amoung the thousands of invertebrates occuring in the Morongo Canyon, a few conspicuous forms include the Western Tiger Swallowtail and Lorquin's Admiral butterflies, several species of dragonflies and damselflies, and water striders, all here because of the permanent water supply.